Western Pacific 653 is an 82-foot heavy weight steel Pullman car configured as a buffet lounge car with sunroom. This car was built by the Pullman Company, lot 4101, as their car “Holton”. It was built as a 16-section sleeping car, plan 2412A, and was released for service in February 1913. 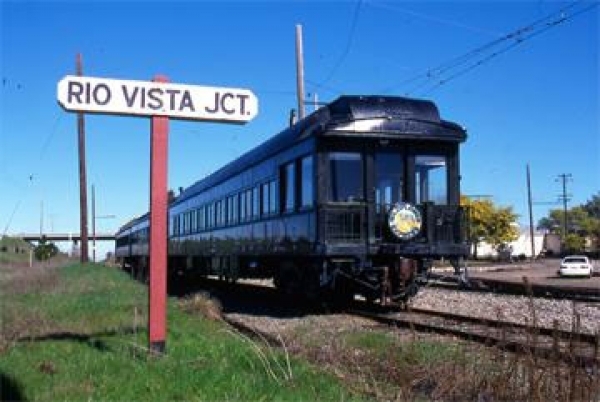 The “Holton” was part of a 20 car series and was built for train “San Francisco Overland Limited”. In May 1931 the Pullman Company rebuilt the car into a buffet lounge car with sunroom; plan 4006B, for the Western Pacific Railroad as their number 653. The WP leased the car from Pullman for five years. In September 1936 the Western Pacific purchased the car from The Pullman Company for $38,629.97. It was used on the train “Exposition Flyer”. The car was part of a three car series, 651-653. Owners: Western Pacific 653. Pullman “Holton”. Trucks: The car has six wheel trucks, type 1910, with 36 inch steel wheels and 5 X 9 plain journals. Air Brake Equipment: The trucks have clasp brakes with iron shoes. The brake system is type UC and the car has one 18” brake cylinder. Dimensions: This is an all steel car that is 81 feet 10 inches long and weighs 84.5 tons. Current Condition: The car is complete and in good condition. Proposed Future Treatment: Needs to be painted and have proper gold leaf lettering applied.